Which #elxn is your favourite? Election 42 is almost in the books, is that a relief or cause for concern? Are you worried that Election 43 will be here sooner than you want? Will 2018 be the year we have three elections in Ontario? 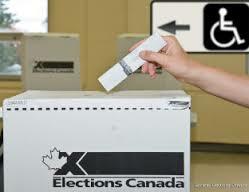 Will the winner of Election 42 make it through to Canada’s 150th? I know a few that feel Election 41 was the BEST! Was this the ‘most important’ election ever for Canada? Should the next election have that moniker? Should we have waited until the next election to use that term? It does it get over used. EVERY election is an important election, is one more important than another? That is almost like asking a parent which one of their children they love the most. This election has been the ‘hate’ election, and personally that scares the living daylights out of me. Elections are about hope, the future and yes one form of change (a leader, party or direction). Even though the leaders of ALL parties did not utter the word hate, it was certainly inferred each and every day. The tone of this election changed from the pre-election “whip out their f-18’s” to this elections opening week “stop Harper”, and it almost happened in the blink of an eye. I am not big on the use of the word hate, I have preached to my two kids, now, young adults, to not use the word – that hate starts wars. If you don’t like someone you dis-like them, not hate. I wish we could go through an election cycle without anger rearing its ugly head, that we don’t stop someone but we start something and that hope is what we reach for and fear is what we will not raise. The partisan emotion reached new highs, causing friends to declare an election truce and not to talk politics – that’s how divided Canada has become. Strangers were venting with such veracity to supporters of other political parties that it became personal with others we didn’t even know! What kind of craziness is that? Have we started down a slippery slope that we cannot reverse? Should we be wary of the attitudes that Election 43 will bring out in us? There were a few days where I envied the apathetic voter, they didn’t care and didn’t get caught up in the fervour. Election 41 was the ‘shock’ election, I’ve call Election 42 the “h@+&” election and I am here and now naming Election 43 the “New Hope” election where ideas are brought forward, debates become discussions and rhetoric disappears. This entry was posted in Canada, Elections, Politics and tagged #cdnpoli, #elxn42, #elxn43 on October 15, 2015 by redheartbluesign.